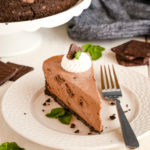 This Easy No Bake After Eight Cheesecake is the perfect decadent dessert for the holidays that's creamy, chocolatey, and packed with chocolate mint candies! Combine the Oreo baking crumbs and the melted butter in a small bowl and press into the bottom of a 9-inch springform pan. Press a little bit of the mixture up the sides of the pan, if desired. In a large bowl, whip the cream cheese until light and fluffy. Slowly add the powdered sugar and cocoa powder and continue whipping on low speed until fully incorporated. Fold in the whipped cream and peppermint extract gently just until no streaks of whipped cream are visible. Fold in the chopped peppermint candies until evenly distributed. Pour the mixture into the springform pan on top of the crust and smooth out the top as much as possible. Set in the freezer for about 5 hours, or overnight. Remove from the freezer to the fridge about 1-2 hours before serving. Garnish with whipped cream, peppermint leaves, and chopped peppermint chocolate candies. This cheesecake can be made in advance and stored in the freezer for up to a week in advance. Cover with an airtight seal to prevent freezer burn.